I sometimes jokingly refer to myself as 003, which means I have been active at the national level (55 years) of the conservative movement longer than every living conservative, except for two others. 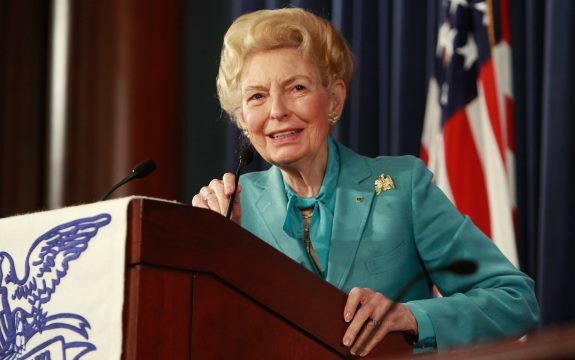 And, of course, 001 for many years has been the beloved First Lady of the Conservative Movement – Phyllis Schlafly. Phyllis will always be #1 in our hearts and minds. We just heard from Congressman Steve King of Iowa. He spoke eloquently about Phyllis. On more than one occasion, I heard Phyllis say that we should run Congressman King for President. And I was just thinking how ironic it would be if Phyllis, who spent her entire adult life trying to overthrow the Republican kingmakers, was successful in becoming a kingmaker herself by making Congressman King President of the United States. We’re here this morning to pay our respects to the Schlafly family and honor our dear Phyllis Schlafly. Many years ago, I decided that when I wanted to honor someone who had passed away, I would identify a particularly admirable quality that they held and adopt it to myself. Of course, Phyllis had many admirable qualities. But perhaps her #1 quality we admire was her leadership. When Phyllis saw a need and identified a problem, she rushed in and provided leadership to solve that problem; she didn’t wait for an “invitation” to lead. Today, there’s no shortage of problems that need leadership. But before Phyllis would step forward and lead, she would read, read, read and study, study, study the problem. Then, she would call meetings and step out of her comfort zone. Remember, we just heard her son mention that she considered herself to be naturally shy. So, I commend to all of you that to honor Phyllis, there’s no better way than to select a problem that needs solving but lacks local, state, or national leadership. Like Phyllis, read, study, then rush to the sound of the guns—don’t wait for an invitation to lead. As the gospel of St. Luke says the harvest is abundant but the laborers are few. Last night, Eagle Forum showed Hillary’s America, a Dinesh D’Souza movie. One of Dinesh’s earlier films was America: Imagine the World Without Her. I think the same can be said of Phyllis. America: Imagine the World Without Phyllis Schlafly these Past 60 Years. Maybe no conservative movement if she had not written A Choice, Not an Echo, in which she explained to us that our #1 opponent is the big government Republican kingmakers. Maybe no conservative movement after the 1970s when Phyllis saved the movement she helped launch in the 1960s. In the mid-to-late 1970s, conservatives lived through a darkness of Biblical proportions which included Agnew’s and Nixon’s resignations, Reagan’s loss to Gerald Ford for the 1976 GOP nomination, Ford’s loss to Carter in 1976, and Democrats with strong Congressional majorities. But, at the same time, Phyllis was doing what conservatives seldom do – which was win. She was beating the Democrat and Republican kingmakers, the feminists, and the national media. She gave us hope and showed us how to win. Maybe no Ronald Reagan presidency without Phyllis saving the conservative movement in the 1970s. Imagine an America with the Equal Rights Amendment being part of the Constitution for the last 40 years. Many in this room would not have been activists without Phyllis’ encouragement. Tens of thousands would not have been educated and activated. Those tens of thousands would not have educated, activated, and trained millions of others. I fear when I think of an America without Phyllis Schlafly these last 60 years. This morning, in thinking of Phyllis, several thoughts occurred to me from the Bible. Moses labored for 40 years to lead the Israelites—a difficult people to lead, a stiff-necked people. He took them where they did not want to go and was greatly criticized for his leadership. However, while Moses was allowed to see the Promised Land, he was not allowed to cross over into it. Phyllis labored for more than 60 years to lead conservatives—and we were difficult to lead and, in many ways, a stiff-necked people. Phyllis was greatly criticized. Yet, she lived to see the utter defeat of the kingmakers in the 2016 presidential election, and lived to see the rise of a new coalition of populist, Trump-type conservatives and grassroots constitutional conservatives. This coalition has replaced the old, ineffective establishment Republicans and constitutional grassroots conservatives. But, like Moses, she could see the new political coalition but was not allowed to be a part of the new political promised land. God bless and keep Phyllis Schlafly, her family, each of us and our families, and America. Submitted by Elaine Donnelly on Wed, 09/21/2016 - 17:24. Richard, you identified the most important quality that Phyllis had, leadership. She worked hard for decades to develop that quality in others, especially women who had not been leaders before. As you said, she mastered each issue, from both sides, so that she could confront the weakest arguments being made by liberal adversaries. Phyllis' influence will be felt for many decades -- thank you for providing insight into why she was so important.